The youngest of 4 kids, Marcie has 3 protective, older brothers Mickey (Mike Jr.), Maddy (Mathew), and Martin. Her dad is a cop – Officer ‘Big Mike’ McDoogle. Her mother Margaret is a round, short woman who keeps them all in line. 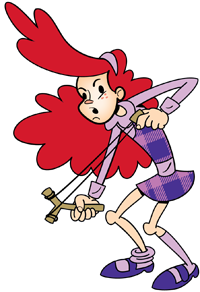 So imitating her mother, Marcie keeps the boys of the Graveyard Gang honest, not letting them get too mischievous. She is tall and gawky for her age but surprisingly strong. Marcie has a slingshot and her sure aim comes in very handy during their adventures. Marcie attends the Our Lady By The Sea Church’s all-girl parochial school. It’s there she met her pals Cora Kane and Ann Chan and together they formed their Graveyard Girls’ Club. They’re usually seen all wearing their identical school uniforms.